Tucked behind a magnolia tree on a busy Georgia road is a magical place--a simple country farm, unchanged by time. On this little strip of land, chickens scratch greetings and goats bleat hello. Sweet yellow corn grows tall, and curly bean vines reach for the sky. A burly tractor and a fifty-year-old Chevy wait inside the shed, ready for action. For some folks, farms trigger childhood memories, such as Sunday supper at their grandparent's table, or recollections of past generations smiling from picture frames gathering dust on the mantle. For 82-year-old Billy Albertson, his farm reflects a time before folks were hurried, or technology ruled our lives. Families grew gardens and feasted on fresh vegetables, adults spent time on front porches comparing stories, and children scampered barefoot through the grass waiting their turn at the hand-cranked ice cream freezer. Spending time with friends on the farm is Billy's life. Here you don't have to be a gardener or blood kin to be family. 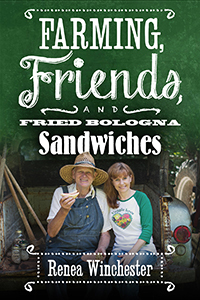 Inside the pages of Farming, Friends, & Fried Bologna Sandwiches is a story about Billy and his magical farm. Like grandmother’s pie sitting in the windowsill, this book will entice you with its stories and love of Southern food. In the winning voice of a friendly farm neighbor, Renea Winchester shares her down-home wisdom on all aspects of the Southern garden and table, from seeds to fried bologna. Her tips are as warm and practical as Georgia sunshine, her applications to life, friendship, and love, universal. A great gift book for a budding gardener, newlywed cook, or to read on the porch with a glass of sweet tea. Made from scratch with plenty of love and attention, Winchester serves us a slice of the Southern good stuff in this collection of wisdom pulled straight from Billy’s garden and kitchen. With sentimental dirt-beneath-your-nails tales about cooking everything from potlikker and fried bologna sandwiches to black-eyed peas and hog jowls, there is nothing fancy here. Just a real down-home connection to the food we eat, the farmers who grow it, and the bonds we build around the supper table. No doubt, readers will be shouting a heartfelt Amen and asking for seconds.